Quiet elegance and splendour in a luxury 5 star hotel transformed from historic Georgian townhouses. The restoration of this luxurious 5 star Dublin hotel demanded the highest standards and the designers' brief was simple and clear "To create a space with sensitivity to the 18th century heritage of the building, with light and airy bedrooms." As a result the 123 guest rooms and 19 suites are the epitome of elegance and also supremely inviting and comfortable, offering the finest Dublin City Centre five star hotel accommodation. The interior is designed using Irish fabrics and antiques to reflect the architecture and original interiors of the 18th century townhouses. The hotel offers guests a choice of two restaurants, The Cellar Restaurant and the renowned Restaurant Patrick Guilbaud, Ireland’s only Two-Star Michelin Restaurant. Bars include The Cellar Bar set in the original wine vaults and the intimate cocktail bar, No. 23. Spa - The hotel's Spa is one of Dublin's most refined retreats. The spa is an ideal place to unwind, restore and to invigorate the body and mind, perfect for spa breaks in Dublin. Surrounded by gentle interiors, technologically advanced fitness equipment, an expansive infinity swimming pool, steam room and luxurious spa treatment areas. Swimming Pool - A beautiful 18m infinity swimming pool set in French limestone is the focal point of the spa. At one end, a spectacular trompe l’oeil mural depicting a neo-classical landscape creates a feeling of distance and space. The swimming pool features an environmentally friendly ozone filtration system. Fitness facilities - The efficient gym is fully equipped with the latest cardio vascular machines, audiovisual equipment, free weights and a highly effective personal training service. Guests staying at the hotel can enjoy a luxurious Italian marble steam room for total relaxation after a strenuous workout. The Spa provides male and female changing rooms, finished in a combination of white marble, traditional ceramic mosaic tiles, French limestone and Elm hardwood incorporating unique underground heating, complete the spa’s sumptuous facilities. From high level business meetings in Dublin to private and corporate entertaining, this hotel is one of the most luxurious Dublin conference hotels, the perfect setting for every occasion. 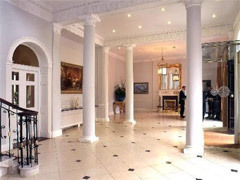 With its own separate entrance and reception, No 24, originally known as Mornington House, home to Lord Mornington, boasts six magnificent rooms over two floors dedicated to private dining and corporate meetings. Designed to be used separately or in combination, the six beautifully appointed salons at this luxury Dublin hotel vary in size and decor, from The Pembroke, which can accommodate 12 people for a top board meeting or private seated meal, to The Wellington, which is suitable for up to 100 people for a reception or a meeting for 50. This hotel is one of the leading 5 star hotels in Dublin boasting state of the art conference facilities including complimentary wireless internet connection, audio visual aids, data projectors and screens and points for microphones. This is one of the best located hotels in Dublin, standing directly opposite Government Buildings in the heart of Dublin city centre. On the doorstep is Upper Merrion Street, where Government Buildings, The National Gallery and The National Museum of Ireland are located. A short walk leads to many lively pubs, shops and restaurants dotted around St. Stephen's Green. Grafton Street is a leisurely stroll away for all the latest designer labels. The hotel provides valet car parking facilities at an overnight charge of 20 EURO. The parking facilities are valid until checkout at 12pm.